If reality mattered, the information in a new report on undocumented immigration to the United States by the Journal on Migration and Human Security would upend the nasty nativism that has consumed the Republican presidential candidates. Here is how Jerry Markon reports the findings in the Washington Post. Although the new report does not cite specific reasons for the decline, other experts have attributed it to a combination of tighter U.S. border security measures and economic and demographic changes in Mexico, such as women having fewer children. Do you recognize all of the ways this discredits almost everything the Republicans have been saying lately? * We are not experiencing hordes of immigrants crossing our border lately. * President Obama actually increased border security. * We don’t need to waste money on a wall. * The REAL issue for immigration reform is not so much about border security as it is about what to do with the undocumented immigrants who are already in this country – many with long-standing ties in their community. Other findings of the paper that should inform the immigration debate are the growing naturalized citizen populations in almost every US state and the fact that, since 1980, the legally resident foreign-born population from Mexico has grown faster than the undocumented population from Mexico. 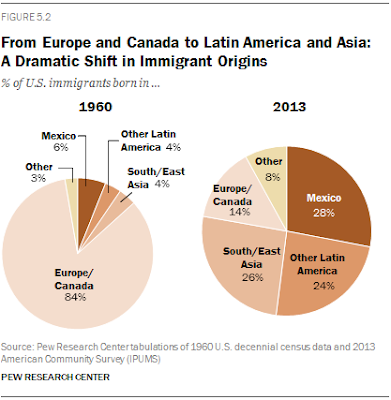 By 2013, most immigrants were from either Latin America or South or East Asia, a very different profile than that of immigrants in 1960 and 1970, who were mostly from Europe.